Tired of boring old quinoa? Need new ideas for healthy entrees – vegetarian or not, or just an impressive side dish for guests? 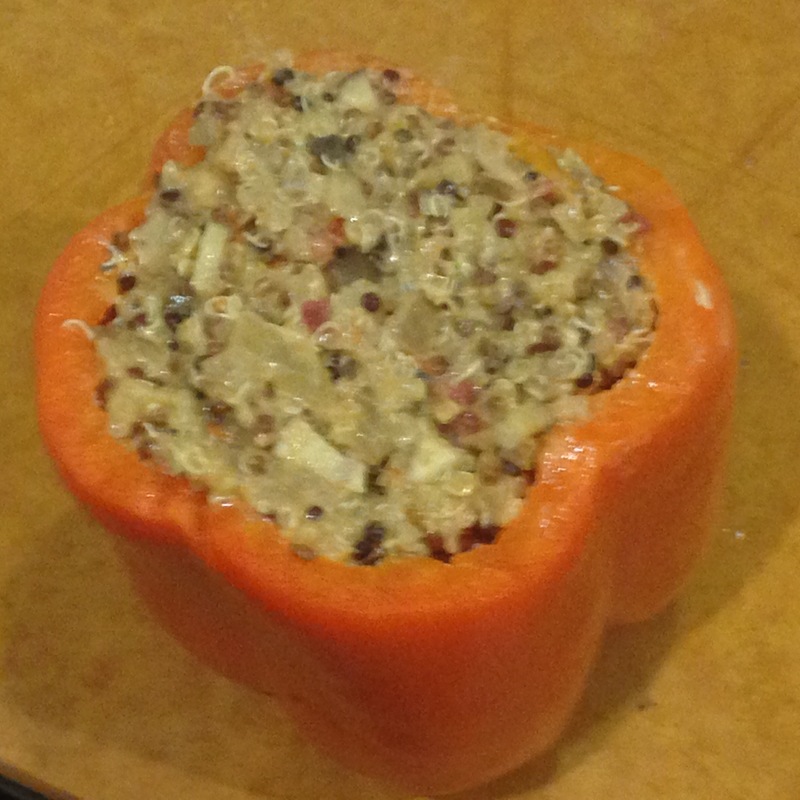 Try this Peruvian inspired delicious bell pepper stuffed with a goat cheese quinoa risotto, also known as quinoto. It is rich, yet light – typically under 300 calories per serving and a great alternative to traditional risotto. At the end of my first trip to Peru a few years ago, I tried quinoto for the first time. The creamy quinoa dish was Peru’s answer to Italian risotto. It was velvety, nutty, and very heavy. Determined to make it at home, I transformed my typical quinoa pilaf into a lighter version with the addition of a few ounces of tangy chèvre. A small amount goes a long way and makes it taste far more decadent than it actually is. Lest you think it too light, the high protein, high fiber content in the quinoa, along with a full, sweet bell pepper gives it enough substance to really satisfy you – or your guests. Tips: I prefer to use chicken broth if cooking for carnivores, but vegetable broth adds plenty of flavor and depth for vegetarians. Also, quinoa can be very messy. 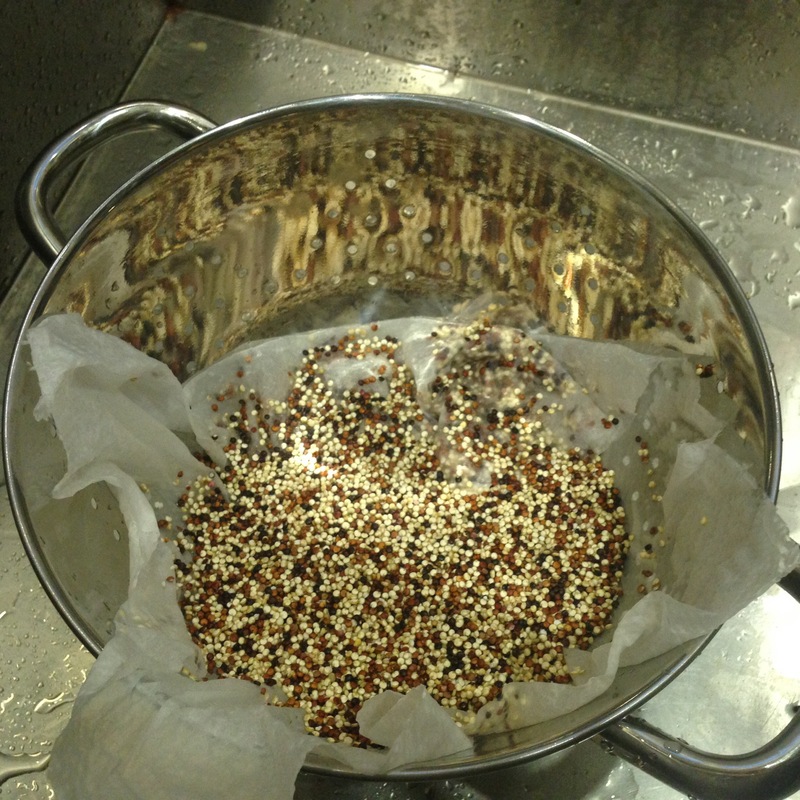 When rinsing (which removes the bitterness from the husks surrounding the seeds), F you don’t have a fine sieve, I like to line a sieve or colander with paper towel to ensure the seeds don’t escape, and then scrape the seeds off the paper towel. You’ll certainly lose a few, but fewer of them! 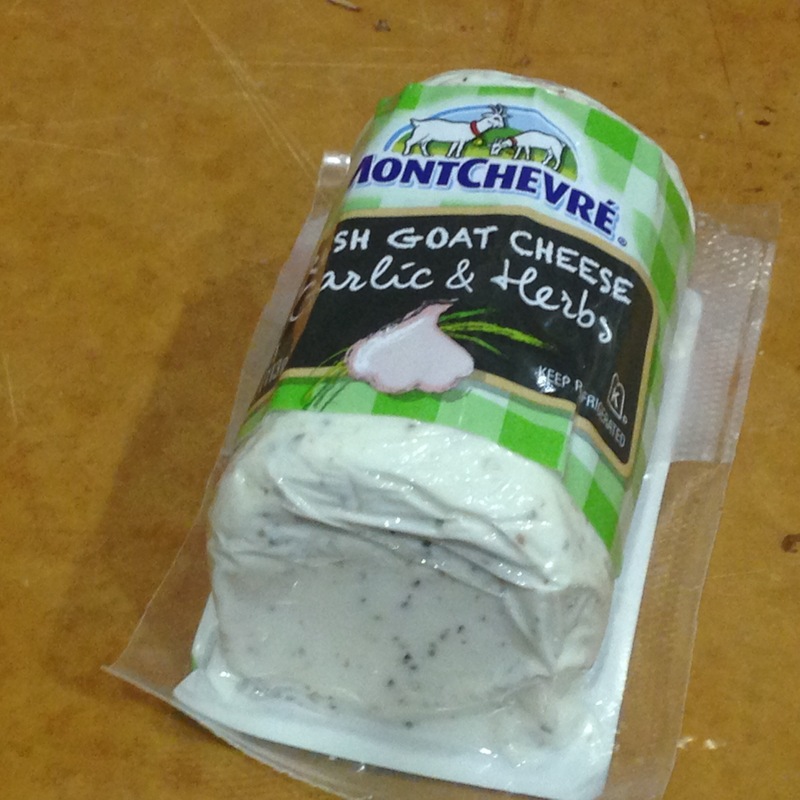 Not a fan of goat cheese? Try parmesan or cotija cheese for a similar texture – and different flavor. 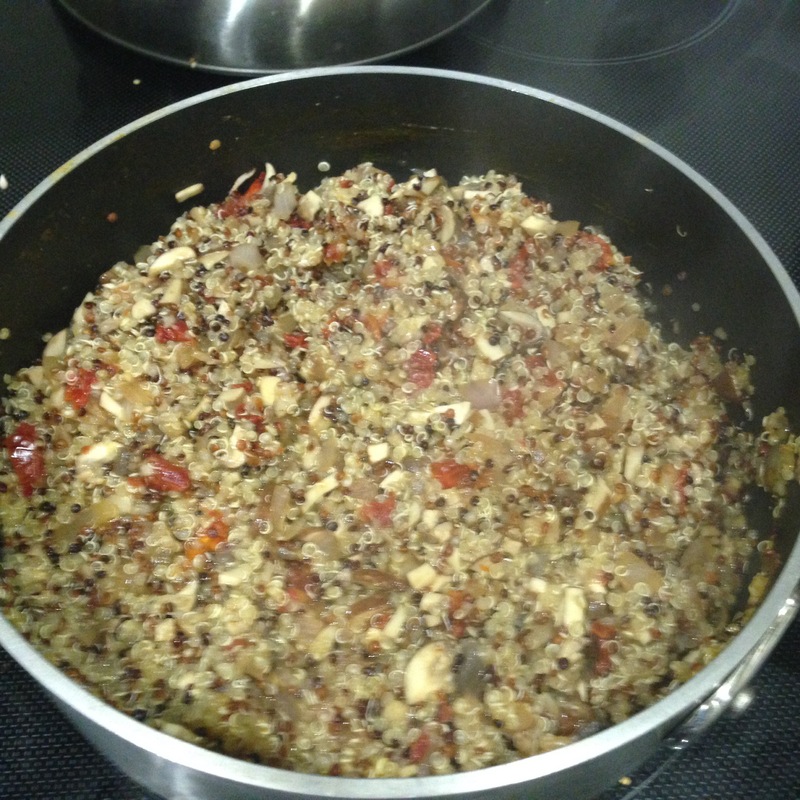 The quinoto can be made in advance. Stuff the peppers, then tightly wrap and refrigerate overnight before baking. 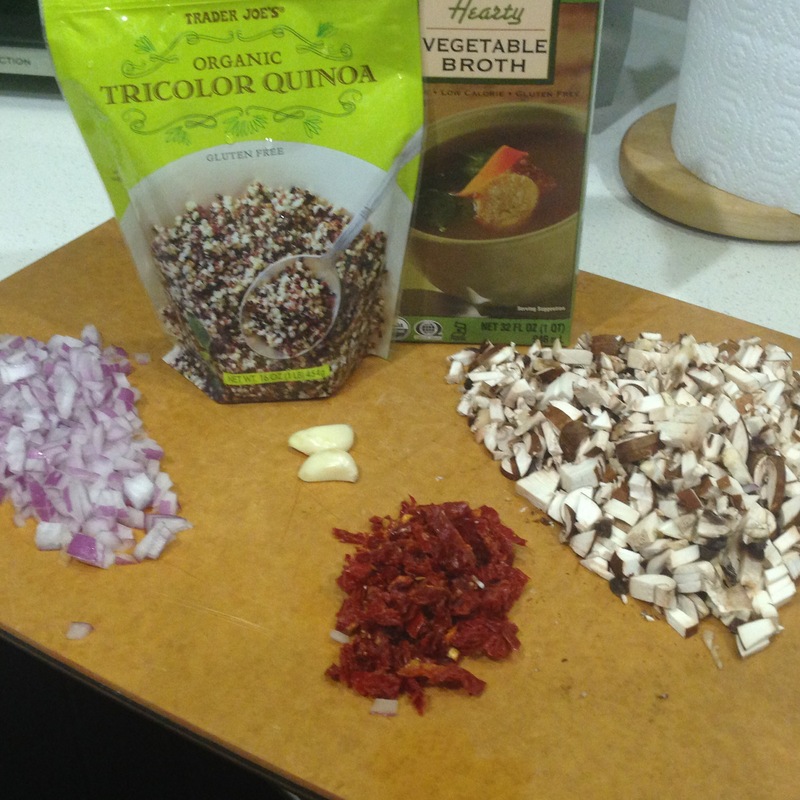 Place the broth and quinoa in a 2 quart (medium) saucepan and bring to a boil over the stovetop. Reduce heat to medium low and simmer, stirring every two minutes or so. 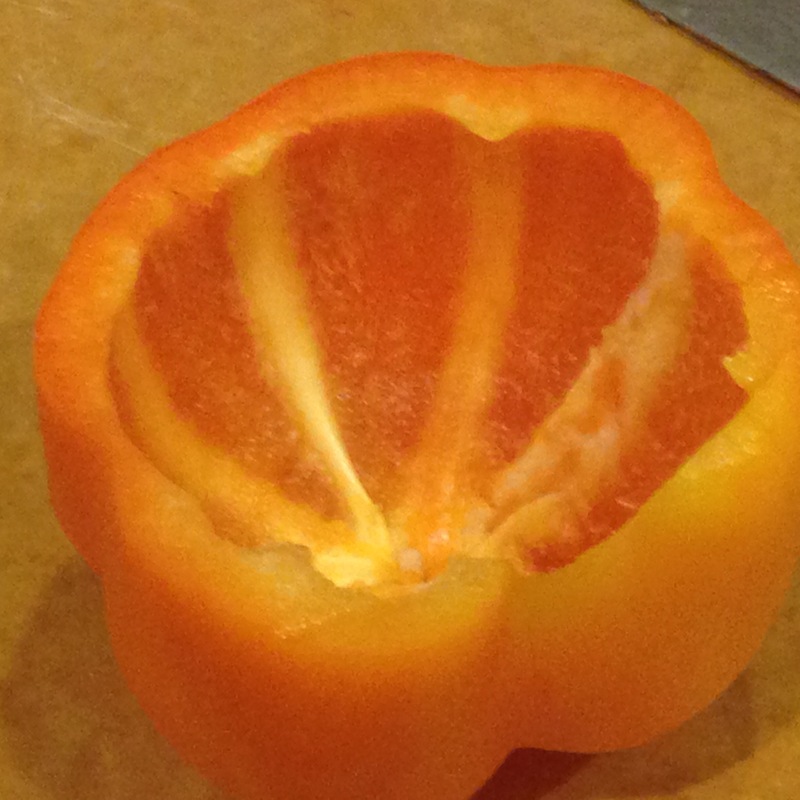 Meanwhile, remove the caps, ribs, and seeds from each bell pepper. Set aside. While the quinoa cooks, sautée the vegetables: Over medium heat, place about 1 Tbsp olive oil into a nonstick or cast iron skillet. 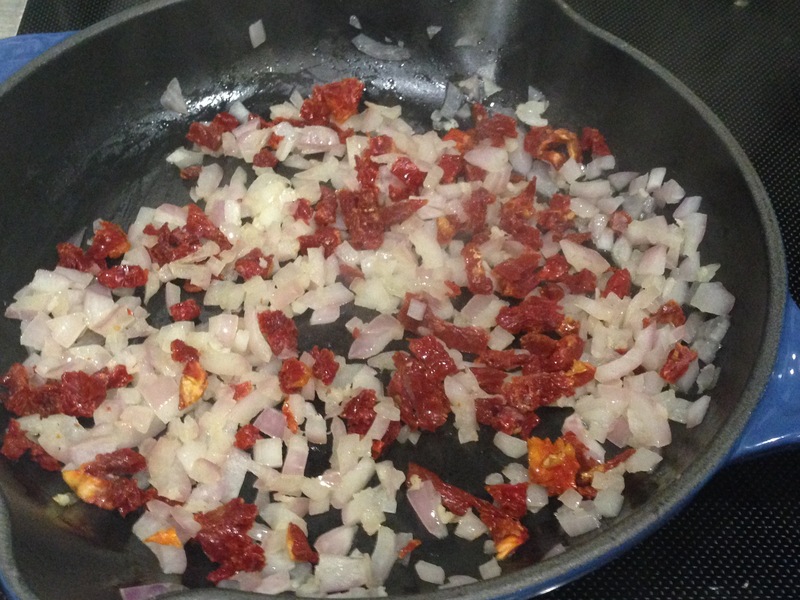 Once the oil is hot, sautée the garlic and minced onion for about 4-5 minutes or until translucent. Add in the tomatoes and mushrooms. Sautée another 3-5 minutes or until the mushrooms have reduced in volume by about half. When the quinoa has absorbed all but a small amount of liquid, add in the wine if using and allow it to heat and evaporate. Next, stir in the vegetables until fully incorporated, over medium low heat. 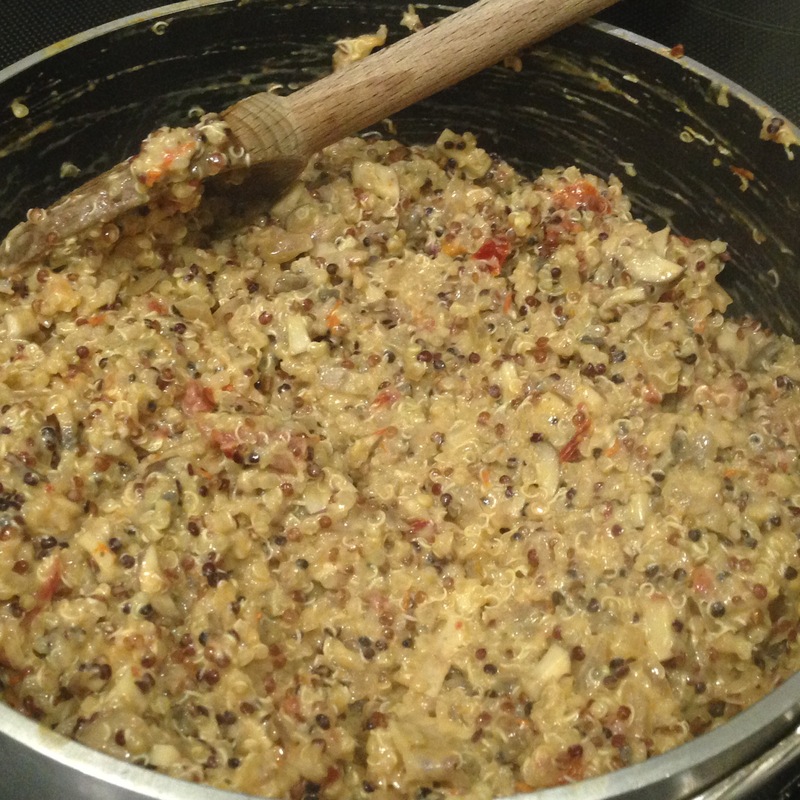 Fold the goat cheese into the quinoa mixture. Remove from heat. If serving immediately, preheat oven to 400 degrees Fahrenheit. Stuff each pepper with roughly one cup of the quinoto, leveling off. Spread a few teaspoons of goat cheese atop the quinoto. Wrap each pepper in aluminum foil. If not serving immediately, refrigerate until approximately 45 minutes before serving; preheat oven to 400 degrees. On a baking sheet – or placing the peppers upright in a large muffin tin – bake the peppers (covered) for 20 minutes. Remove the sheet/tin from the oven. Unwrap peppers and return to the oven for 10-15 more minutes. Remove them from the oven and cool for about 10 minutes before serving. Serve with a garnish of roasted red pepper coulis and basil for drama! Disfrute!